I set off for the club's 5 day break in Northern Ireland having, as it turned out, packed rather too many waterproofs and warm clothes! Seven of us took the Heathrow flight to Belfast arriving mid-afternoon, the other three came up from Dublin. In terrific weather we then took a coach to Portrush. After settling in to our B & B we took a short walk around Ramore Hill and then on to look for an evening meal. Portrush had the feel of a typical seaside resort on a hot weekend, a little like Newquay in Cornwall I thought. Around the harbour area were three restaurants all very, very busy and which we later learnt were owned by the same person – echoes of Rick Stein and Padstow? A long wait for the food but we were rewarded by good food and cheap wine!! Monday was our first full day of walking, Portrush to Giant's Causeway estimated by 'Away a 'wee' walk', our walking advisers. to be 10km. I have to say it felt more! We started at Portrush walking across a beautiful long beach called White Rocks to Dunluce Castle, a now ruined mediaeval castle with an excellent coffee shop nearby! We then followed more or less the coastal path until we reached the spectacular Giant's Causeway. An area of about 40,000 interlocking basalt columns (according to Wikepedia!) and spent approximately an hour before returning to Portrush via the Causeway Rambler Bus. Once again we tried another Ramore establishment, the Harbour Wine Bar, and had an excellent meal. 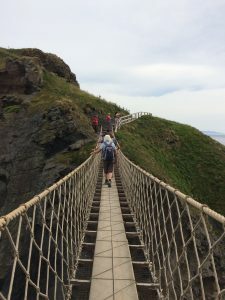 Tuesday was to be our longest walk – Rope Bridge to Giant's Causeway 17km! We arrived via the local bus and walked down to Carrick-a-Rede Rope Bridge originally erected by salmon fishermen and now owned by the National Trust. The very small island is a haven for sea birds and all around the meadows were carpeted with buttercups and other wild flowers. Our route was to take the mainly coastal path back to the Giant's Causeway via Ballintoy Harbour, White Park Bay (challenging rocky bits at both ends of the bay) and Dunseverick. 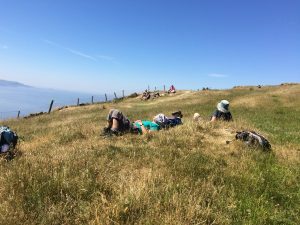 Some of us took a 'wee' too much time exploring sea birds, wild flowers (the rare blue geranium) and rabbits. Consequently we had to speed up considerably just as the sun seemed to be at its hottest in order to catch the bus to Ballycastle, our next B & B.
Wednesday brought a day off as far as walking was concerned as we were visiting Rathlin Island by ferry from Ballycastle. This beautiful island, population, 107, is famous for its birdlife and tranquility (providing you are away from the birds!) and seals. Also former resident Robert the Bruce and Marconi who was offered a contract by Lloyd's to set up a radio link to Ballycastle. Most of us took the Puffin Bus to the RSPB Bird Sanctuary where an amazing number of seabirds were gathered on the cliffs. Thursday our last day of walking took us to Murlough Bay and Fairhead Loop – approx 13km and many locations used in filming the Game of Thrones, much to the delight of fan Jane Sellwood. Taxis took us to the start of the escarpment in the morning and we explored the Murlough Bay area with some difficult terrain. The second part of the walk took us round the top of Fairhead escarpment, an area much used by climbers. Dinner was again at the Central Wine Bar where we ate the previous night so we could watch England playing Belgium in the world cup! Not a great experience! So finally our last day, Friday, and back to Belfast and a chance to look at the city, the Titanic Exhibition and take an extremely interesting and informative open topped bus tour before our late afternoon flight home. Many thanks to Hilary for organising such a wonderful trip and to Alison and Dave for leading the walks. Also thanks to all involved and not least the great weather which helped in no small part to make the trip a great success.